Click this photo to view full size painting. The Gundalow BOSTON was built at Skenesboro (now Whitehall) New York during the period June-July 1776. 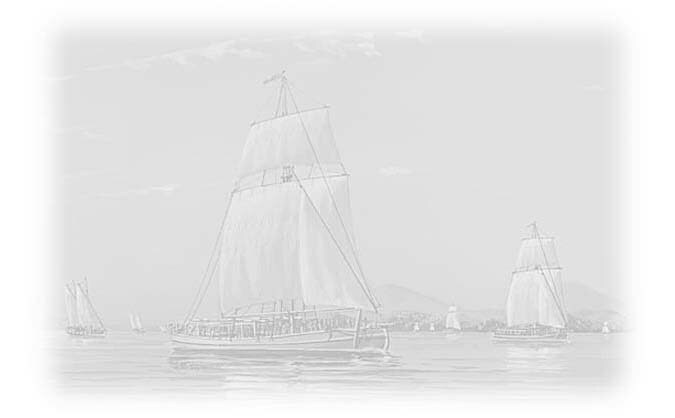 Part of a fleet that was commanded by General Benedict Arnold, she took part in the Battle of Valcour Island (on Lake Champlain) that delayed the British invasion intended to divide the American colonies. This BOSTON was grounded and burned to prevent capture by the British squadron at Buttonmold Bay, New York, on 13 October 1776.